Like aquatic and terrestrial environments, the aerial environment contains biological information. Using molecular tools, we can detect what organisms are present in the aerial environment in order to: measure biodiversity; reconcile organisms to species level; track phenological changes associated with global change, and gain a better understanding how our environment affects us. Pollen consists of microscopic grains discharged from the male part of a flower or from a male cone. Wind pollinated plants, such as grass, release pollen grains into the air during spring and summer. Using Burkard multi-vial cyclone pollen traps, we will collect aerial samples over a three-year period, from up to 16 sites across the UK. Each pollen trap will be coupled to the seven-day, volumetric pollen traps, which are part of the Met Office UK Pollen Monitoring and Forecasting Network. 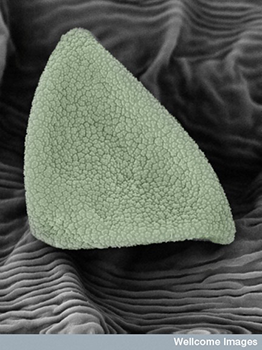 Image of Burkard multi-vial cyclone sampler (Burkard Manufacturing Co Ltd); Image of grass by TutorVista.com; image of pollen by Dartmouth Electron Microscope Facility. 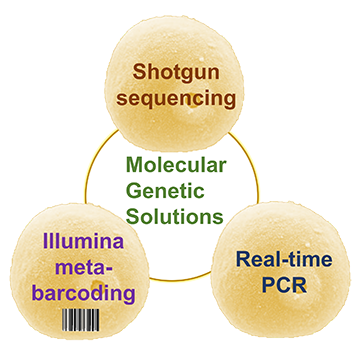 Our aim is to identify grass pollen to species or family level using combinations of shotgun metagenomics, DNA barcoding, metabarcoding and quantitative PCR approaches. Introductory background to all the approaches are provided in Creer et al. 2016. The ecologists guide to sequence-based identification of biodiversity. Methods in Ecology and Evolution. 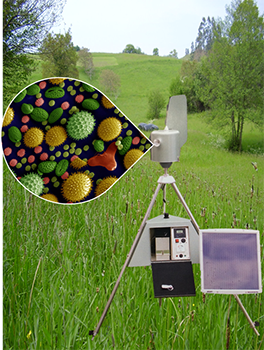 Our ambition is to develop a next generation atmospheric modelling system for pollen at the species level using the combination of a particle dispersion model and an in-line chemistry transport model in order to calculate exposure of grass pollen at the species level. An introduction to the approaches are provided in Sofiev and Bergmann (2013), Allergenic pollen - A Review of the Production, Release, Distribution and Health Impact (see chapters 2-5) by Skjoth et al (2013), Dahl et al (2013), Schefinger et al (2013) and Sofiev et al (2013). Our goal is to estimate population exposures to grass pollen species using the molecular genetics and atmospheric modelling output. Pollen concentrations will be related to geographical/temporal variation in health outcomes such as hospital admissions for asthma, to investigate whether high levels of particular grass pollens are associated with higher rates of respiratory allergic responses in the population.